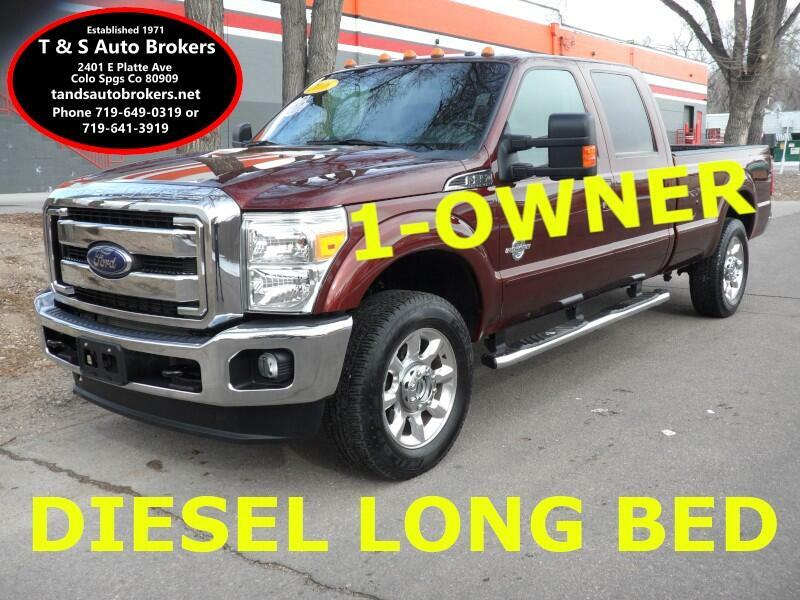 ONE OWNER, DIESEL, 4X4, LARIAT, LONG BED, CLEAN CARFAX, NEW CAR TRADE-IN. WE WILL CONSIDER CERTAIN TRADE-INS. 68K MILES. BEAUTIFUL TRUCK, EQUIPMENT INCLUDES: 6.7L V8 F OHV 32V ENGINE, automatic transmission, AC, power moonroof, leather interior, heated front and rear seats, AC, dual zone climate control, dual power seats, power locks/windows/mirrors, CD and bluetooth, navigation, upfitter switches, trailer brake controller, exhaust brake, towing mirrors, tow package, step ups, tailgate step, remote start, block heater, premium aluminum wheels, tilt wheel, cruise control, etc. Come check it out! FINANCING: We can help arrange financing and work with several credit unions and lenders. Loan approval and rates are based on the customer's credit and situation. For folks who qualify, credit union rates are available. We can help in obtaining financing for credit-challenging situations also. Please call ahead to check availability!!!! 719-641-3919 or 719-649-0319. We have 25-30 pictures of each vehicle on our website; please visit tandsautobrokers.net to see them. T & S Auto Brokers has been servicing the Colorado Springs area and Denver, Littleton, Centennial, Castle Rock, Pueblo, Black Forest, Peyton, Calhan, Woodland Park, Divide, Fort Carson, Peterson AFB, Air Force Academy, Security, and Fountain for over 45 years. We specialize in trucks and SUVs. We are an A+ member of the BBB, and are members of the NIADA and CIADA. Visit T & S Auto Brokers online at www.tandsautobrokers.net to see more pictures of this vehicle or call us at 719-641-3919 today to schedule your test drive.